No matter where you are in the world you will be able to take your journey with us to learn about your Irish ancestry and your clan with our detailed research plans. We undertake research, prepare itineraries and trace Irish roots for our overseas visitors. We have online lectures and live classes so it promises to be exciting and best of all it is designed around your family research requirements. When you need top class research professionals,practical advice with practice based experts and academics to guide you through important Irish family research. The Genealogy Radio Show produced and presented by Lorna Moloney shows what is on offer in Irish family history research. We offer recommendations on guided genealogy trips, vacation assistance, field trips,and expert advice and consultation opportunities for those tracing Irish ancestry. Lorna Moloney produces and presents the Genealogy radio show and has an excellent recommendations and portfolio. 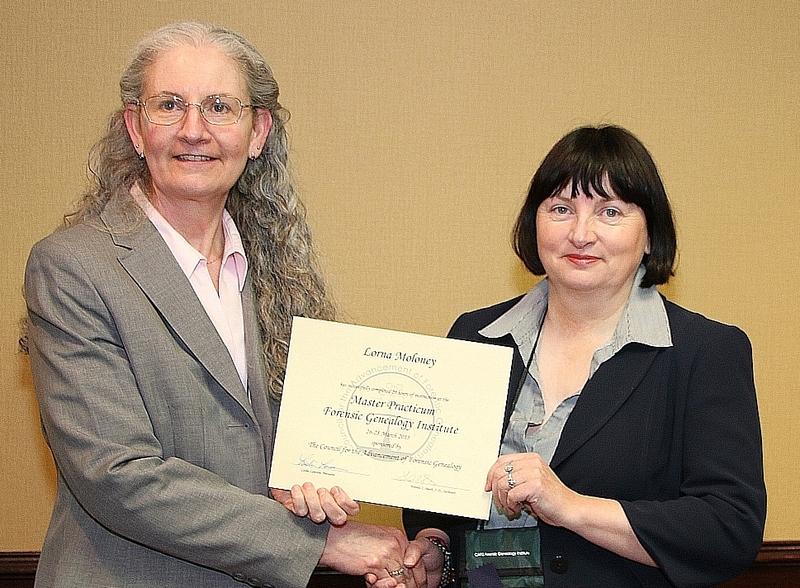 Leslie Brinkley Lawson, President of CAFG presented the Certificate for the Advancement of Forensic Genealogy in Dallas on March 28, 2015. Telephone research available designed to suit all levels of research visits to Ireland from Irish leading genealogist Lorna Moloney. available to US, Canada, Australia, New Zealand and UK and Ireland. Please email Irishroots@clansandsurnames.com for rates on same.